With the NFHS requiring all states to implement pitch count rules, this has created a number of issues that go beyond just counting pitches. There will now be eligible and ineligible pitchers and in order for coaches to effectively manage their teams, it’ll be crucial that they know the exact status of pitchers. Not having this information could result in a forfeit because a coach inadvertently uses an ineligible pitcher or a team could suffer a loss because they didn’t know that the opposing team was using an ineligible pitcher. Either scenario is enough of a concern to keep coaches awake at night. But there is another, deeper issue at play as well. As with any set of rules, it’s vitally important that there is sufficient oversight to ensure that everyone is in compliance and that there’s a level playing field. In order to establish and maintain competitive balance, there has to be a system to monitor the process of recording pitch count data, verifying the accuracy of that data, ensuring that each pitcher’s status is correct, and that teams are adhering to the required days of rest. No small task, but this is precisely what PitchKount does and why it’s so valuable. Not with PitchKount, it automatically performs these functions for you. 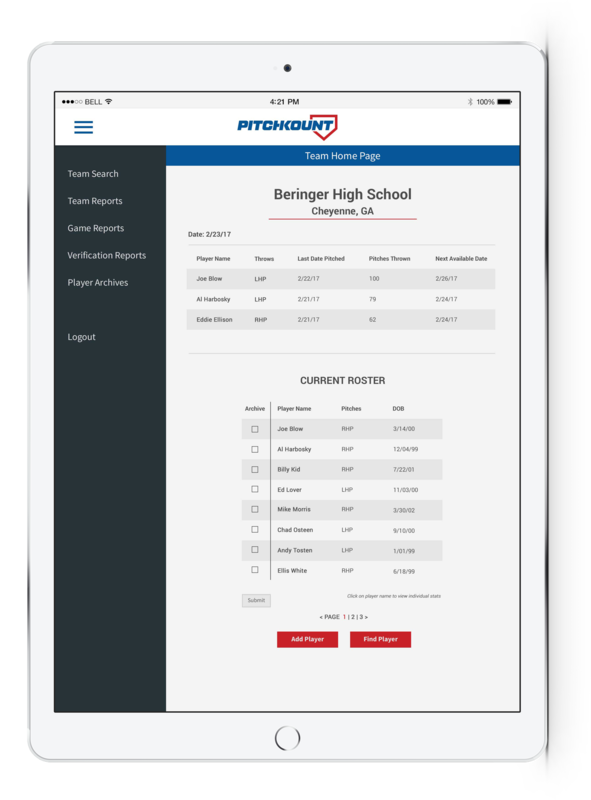 Using the verified data and your specific Athletic Association’s rules, PitchKount determines each pitcher’s “Next Available Date” and provides this information to you in a daily Pitching Report. PitchKount provides each team with a Pitching Report that lists those players who are not eligible to pitch. This report updates daily and coaches can print it out or use a mobile device to access it from the dugout. Some players pitch on both our sub-Varsity and Varsity teams. How am I going to keep up with that? Great question, because pitch count rules apply for pitchers across all levels. No worries though, PitchKount tracks all your pitchers and puts this information at your fingertips every day via the Pitching Report. How do I know that other schools are abiding by the pitch count rules and playing it straight? Quite the contrary, it reduces it. As a cloud based, independent application that does not require any type of download or software installation, PitchKount provides a low-touch, comprehensive solution to managing pitch count rules. Coaches and Athletic Associations won’t be tasked with record keeping, verifying data or determining required days of rest. PitchKount will lessen the load on coaches and Athletic Associations. There are multiple Athletic Associations in our state. How does PitchKount know which rules to use? Teams within each state and specific Athletic Association are grouped together so that the correct set of rules are applied. Our team changed to another Athletic Associations that has different rules. What now? PitchKount is updated each year and schools that change to a different Athletic Association are moved within the system to reflect this change. We’re playing a team from another state. Will PitchKount still work? Absolutely. Within PitchKount, each team is linked with their home state and specific Athletic Association. It doesn’t matter who a team plays– once data for a team has been verified and recorded, that team’s specific set of rules are applied. So, you can play a team from another state or even another Athletic Association and your rules will apply to your team while your opponent’s rules will apply to their team. Subscription covers all the teams at a particular school (Varsity, JV, B-Team, Freshman, etc).